In November 1985, Lockheed was awarded a contract to develop and test the ERIS (Exoatmospheric Reentry Interceptor Subsystem) ballistic missile interceptor as part of the ground-based missile defense system within the SDI (Strategic Defense Initiative) program. ERIS was to become an upper-tier system, complemented by the lower-tier HEDI (High Endoatmospheric Defense Interceptor). 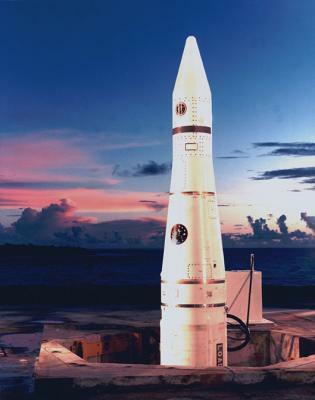 The ERIS test missiles consisted of the second and third stage (Aerojet General M56A1 + Hercules M57A1) of surplus LGM-30A/B Minuteman I ICBMs, which boosted the hit-to-kill interceptor vehicle into space. Sensor and guidance technology of the ERIS KKV (Kinetic Kill Vehicle) was based on the experience won by the earlier HOE (Homing Overlay Experiment) tests. Because of technology improvments the ERIS KKV, which used an inflatable octagonal "kill enhancer", was significantly smaller and lighter than the HOE KKV. All ERIS tests used Orbital Sciences Aries missiles as delivery vehicles for the target RV (Reentry Vehicle). On the first intercept attempt on 28 January 1991, the target RV deployed two balloon "decoys" on each side, but the KKV was preprogrammed to home on the center target (i.e. the warhead). The RV was successfully destroyed at a closing speed of more than 13.4 km/s (44000 fps) at an altitude of 270 km (145 nm). In the second test on 13 March 1992, the target RV deployed a single decoy balloon and the KKV had to make the warhead/decoy decision by itself. Although the seeker logic of the ERIS KKV reportedly identified warhead and decoy correctly, no hit was scored because target detection was a bit late (partially because of preplanned test requirements), giving the KKV not enough time to manoeuver to the intercept point. Despite the partial failure of the second test, the ERIS test program was considered fully successful, and two of the originally planned four tests were cancelled. Because of the changed world situation after the end of the Cold War, the SDI program was somewhat reoriented in the early 1990s towards what was then called GPALS (Global Protection Against Limited Strikes), and ERIS itself was not directly developed into an operational system. However, experience and technology developed during ERIS was put to use in the current missile defense programs, like THAAD (Terminal High-Altitude Area Defense) and the GBI (Ground-Based Interceptor) missile of the GMD (Ground-Based Midcourse Defense) system (formerly NMD; National Missile Defense). I have no data about the exact physical characteristics of the ERIS test vehicles. For data on the Minuteman I 2nd and 3rd stage motors, refer to the LGM-30 Minuteman page.